Sealed in a high security bank vault during the Second World War, the regimental treasures of the Gordon Highlanders were thought to be safe. The men of the 2nd Battalion had been taken in captivity by their Japanese adversaries as Singapore fell in 1942, but their colours and a wealth of silverware had been preserved. 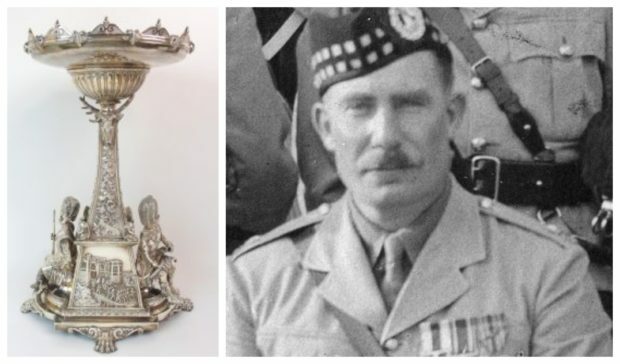 So mystery surrounds the reappearance in Scotland of a beautiful silver fruit stand, belonging to the Gordon Highlander regiment but missing for nearly 80 years. The antique, created with sufficient skill and artistry to grace any military regiment, dates back to the 19th Century and has been valued at between £6,000 and £7,000. It was believed to have been lost in south-east Asia but has now been rediscovered in the west of Scotland, and the Gordon Highlanders Museum in Aberdeen is working to establish how it made its return. 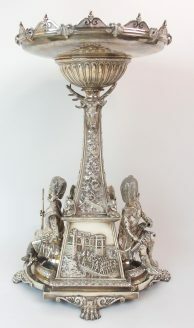 The silver artefact was originally listed as a “silver dessert table” and was part of a sale which is to take place this weekend at the Great Western Auction House – overseen by auctioneer and TV regular Anita Manning. Following discussions with museum staff in recent weeks, however, it has been withdrawn from the items going under the hammer. Ruth Duncan, the museum’s curator, told the Press and Journal that investigations were continuing and revealed the table was actually once part of a pair, although there has been no sign of the second object. She said: “We had no idea of this piece’s existence until its appearance on the auctioneer’s website, which was brought to my attention by some of the museum volunteers. It was a real surprise. “The regimental secretary made inquiries within the regiment and started digging through the archives to see what we could find. “I discovered that this was listed in a regimental mess property book as a fruit stand, and was one of a pair, but it was one of our long-serving volunteers who found a list that helped us to start piecing together elements of this mystery. A valuable antique item has mysteriously reappeared in Scotland. “My understanding, prior to the list being unearthed, had been that nearly all the silver was reclaimed from a bank vault in Singapore, having been deposited there by the battalion’s commander, Major Jack Stitt at the end of the war. “But now we know this is not necessarily the case at all. “After the silverware was locked in the vault, it appears to have vanished. “We know he issued a request to his colleagues to try to work out what had happened, but we have no record of what became of either of the pair. The 2nd Battalion was captured after their Japanese adversaries took control of Singapore in February, 1942. They were based in Malaya and surrendered, along with 130,000 British Commonwealth soldiers. They subsequently suffered more casualties as prisoners of war in Japanese captivity than they did during the fighting on Singapore Island and Malaya. Ms Duncan said: “It was a very difficult time for the battalion and they suffered grievous losses. There was obviously a lot of chaos throughout the war. “In terms of where the items were deposited, the silverware was placed in the vaults of the Hong Kong, Shanghai Banking Corporation – or, as it’s know today, HSBC. “On his release, Major Stitt went straight to the vaults to retrieve the items, mainly because the colours were in there too and he retrieved them. “The colours have been and always will be the priority to be saved. The silverware was a bonus. Talks are ongoing between the museum and the auctioneer.